Tuna, shiso herb, and cucumber chirashi sushi is an easy and quick kid-friendly mixed sushi, also known as scattered sushi, which can be whipped up in 10 minutes if you've got steamed rice leftover in your fridge or warming in your rice cooker. Sushi rice, seasoned with a sweet vinegar mixture, is topped with canned tuna, and then garnished with a chiffonade of green shiso (perilla) herb and cucumber matchsticks. A tiny pinch of sweet sakura denbu (dried fish) adds color and sweetness to create a tasty and beautifully presented dish. Sakura denbu is a staple in Japanese cuisine and is a dried flake fish that is fluffy, light, and pink. Its flavor is slightly salty but mostly sweet. It's commonly used in children's bento lunch to garnish steamed rice. Because of its festive pink color, it is also a popular garnish for dishes such as chirashi sushi (also called mixed sushi or scattered sushi). This recipe assumes that steamed rice is cooked and available for use. If not, please make rice according to your rice cooker's instructions, or make steamed rice stovetop with this recipe available here. Take two servings of rice and place in a medium-size bowl. Fan the rice to cool slightly and sprinkle Sushinoko brand powdered sushi vinegar over the rice to season. Using the edge of the rice paddle, "cut" the rice diagonally and toss to mix. Note, this motion prevents the rice from becoming smashed. On individual servings plates, spread sushi rice out. Garnish sushi rice with roasted white sesame seeds. In a small bowl add drained canned tuna. Squeeze a small amount of fresh lemon juice over the tuna and toss. Break up any large chunks of the tuna. 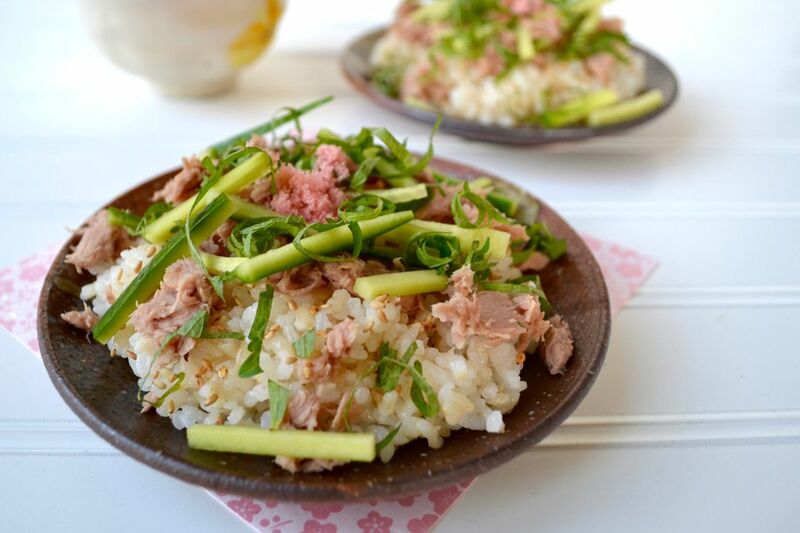 Garnish the rice with sesame seeds with tuna flakes, and cucumber matchsticks. Chiffonade shiso leaves. Stack the leaves together, roll up, then slice into thin pieces. You should end with thin pieces of shiso that resemble ribbon. Garnish the sushi with shiso. Finally, add a pinch of the sakura denbu to the center of each chirashi sushi plate. Serve immediately. Substitute canned tuna with canned white albacore. Another prepared fish to try is canned salmon or even smoked salmon. Try shredded raw carrots instead of cucumber matchsticks. If not making homemade sushi rice vinegar, try Sushinoko brand powdered sushi rice vinegar.